Project #1 involved the replacement of an existing bridge on a Bear Park Township road in Norman County with a flood detention structure. This structure was constructed with extensive coordination with the Norman County Highway Department, Minnesota Department of Transportation, and the Sand Hill River Watershed District. In 1977, the Board authorized preliminary studies on this project and applied to the Lower Red River Waterhsed Management Board for funds. On September 18, 1978, the Board of Managers officially instituted this project by a unanimous resolution of the Board of Managers. The replacement flood detention structure serves the dual purpose of providing a safer and more adequate road crossing across the Sand Hill River, as well as serving as a flood detention structure. The proposed strucutre is located on the township road between Sections 11 and 12 of Bear Park Township (T146N, R43W), Norman County. The structure provides approximately 3800 acre-feet of storage with no permanent pool. The impoundemnt area stretches upstream approximately 4.5 miles to the Polk County and Mahnomen County line. The preliminary engineering report for this project was completed and submitted to the Board on March 15, 1979. On March 19, 1979, copies of the preliminary engineering report were sent to the Water Resources Board and Department of Natural Resources for their review. Permit applications were submitted to the DNR and the U.S. Army Corps of Engineers on March 20, 1979 and March 23, 2979, respectfully. A public hearing on the Engineer's and Viewer's Report was held July 10, 1979. On July 17, 1979, the Board of Managers ordered their attorney to go ahead with condemnation on the lands not acquired by easement. The Water Resources Board's comments were received July 26, 1979. An agreement between the Lower Red River Water Management Baord and the D.N.R. of the State of Minnesota was made October 2, 1979. This agreement says that 50% of the project costs, not to exceed $180,500.00 will be paid by the State through the Legislative Committeee on Minnesota Resources. The validated copy of the Department of the Army, Corps of Engineers Permit was received January 22, 1980. All the land needed to construct this project was not readily obtainable. Several landowners preferred that the Board take their land by condemnation. These landowners felt that they would receive more damages for their land in this mannr. A petition for condemnation was filed on May 27, 1980. The prelininary hearing took place at 2 PM, July 2, 1980 in Mahnomen, MN and the land was available to the Board later in 1980. On October 21 and November 18, 1980, the additional information required by the Dam Safety Section of the Minnesota Department of Natural Resources was submitted. On November 26, 1980, the DNR permit was received. The bid opening was held on October 29, 1980 and the low bidder was Drewes Construction, Co. of Detroit Lakes, MN with a total base bid of $183,132.55. The Watershed District entered into a contract with the low bidder on December 15, 1980. Construction started on June 10, 1981 and was virtually completed in October 1981, with exception of seeding and some minor clean-up work. This proejct was completed and accepted by the Board of Managers in July 1982 with a construction cost of $202,905.85. In 1984, Drewes Construction completed the construction of an access road on a parcel of land within the reservoir area. 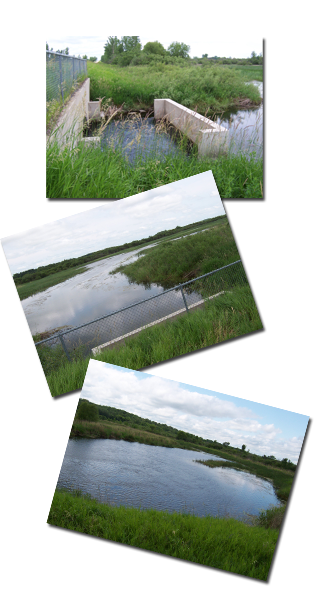 In 2013, the district began alternative analysis for improvements that would assist in reducing the Sand Hill Watershed’s contributions to flooding on the main stem of the Red River of the North. The project drainage area lies in the “middle” region of the Red River Basin, as defined by the Red River Flood Damage Reduction Work Group. The runoff produced from this area contributes to the peak on the main stem of the Red River, and a strategic method of reducing the impact of these areas is to store the water on the landscape. Project benefits include providing gated storage for up to 5,600 acre-ft, enhance benefits of the existing project for lands adjacent to the Sand Hill River and Red River, and the project is part of the Red River Basin Commission’s Flood Damage Reduction Strategy. Scouting for beaver is done regularily to remove impediments to the river in relation to the structure. In the spring 2017, this district found 4 beaver lodges, and 2 beaver dams in the stretch relating to the Bear Park structure.To see imagry of our spring findings, Click Here. You mut have Google Earth downloaded to view the imagry. Spring 2017 drone footage can be found here. In the fall of 2017 the district found multiple beaver lodges and and expanded their search to include downstream of the structure. To see imagry of our fall findings, Click Here. The fall 2017 drone footage can be found is shown at the top of this page and can also be found here.